Recent RBI guidelines for mobile wallets bring along with them a lot of restrictions on its usage. Probably the biggest pain is not allowing wallet to wallet transfer which many of us do for small amounts. Then sometimes you also might have reasons to load large amounts in your wallet which right now is not possible with non-KYC compliant due to RBI limiting it to Rs.10,000 only. 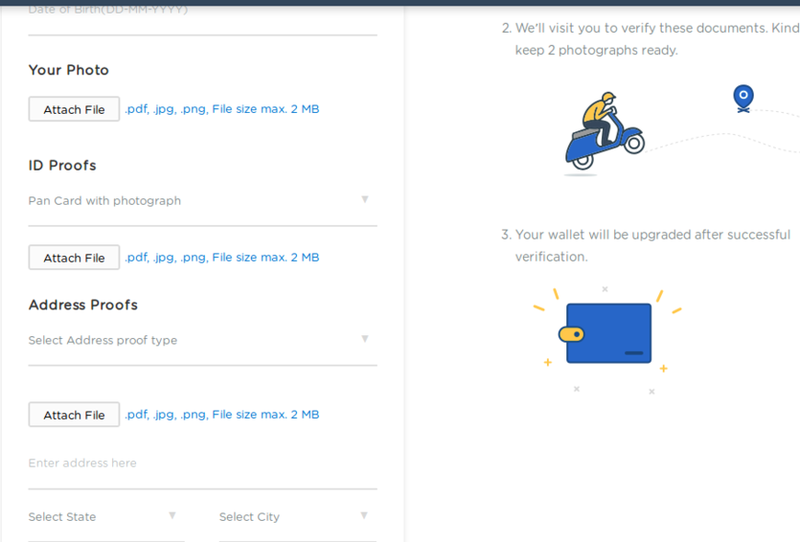 So all in all, to get past these restrictions it is a good idea to get your KYC verification done once so you can use your Mobikwik wallet as you wish to. Digital copy of your photographs, PAN card with your photo visible and an address proof. 2 passport sized photographs for physical verification along with the documents submitted digitally. Go to Mobikwik website and log in to your account. Here you need to enter your Date of Birth and upload your photo, PAN card, and an address proof. If you want the pick up location to be different from what is mentioned in your address proof then there is a checkbox which you need to select before entering the address for scheduling the verification meet up. Once these all details are filled and documents uploaded, just click on Submit to Wallet Upgrade. You should get a call within 1 or 2 days for scheduling an appointment at your mentioned address. Keep 2 photographs, PAN card and the address proof handy for quick completion of the verification. For any doubts or queries, use the comment section below.